The stock market is rising again on some positive earnings being reported. 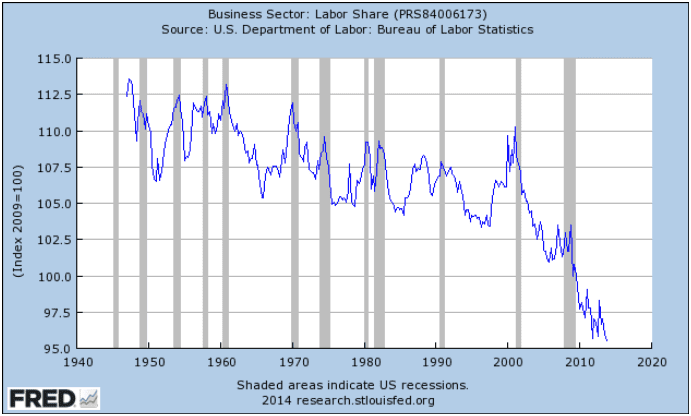 One reason for the nice earnings could be found in another number… the labor share index. Update: My calculations show that that capital income grew $444 billion from 4th quarter 2012 to 4th quarter 2013. While labor income fell by $12 billion. Hmm….and the trend using robots when manufacturing returns will further expand the gap! But research are telling us that manufacturing will not grow very much! Hmm….profits are made elsewere and people have to get a third job just to keep up.